UK based Global New Car Assessment Programme (Global NCAP) has just released their latest car crash test results; and it may be heart breaking for several auto-enthusiasts. As per the latest test results, leading cars which are heavily promoted and advertised in India have received zero rating in the overall list. This means that majority of newly launched and established cars in India are totally unsafe, and cannot protect their riders in case of a heads-on collision. Prominent among the cars which failed car crash test are: Maruti Suzuki Celerio, Renault Kwid, Maruti Suzuki Eeco, Hyundai Eon and Mahindra Scorpio. Entry level cross-over Kwid, which is manufactured by French automobile major Renault, was infact tested for all three versions, the ones with air-bags as well. But unfortunately, all the three versions received zero rating in the crash tests. Similarly, other best selling cars such as Hyundai Eon, Suzuki Maruti Eeco, Suzuki Maruti Celerio all received zero rating in adult occupant position; and between 0-2 rating for child occupant space. For the purpose of crash tests, all these cars were shipped to Germany. Driven at 64 km/hr speed, these cars were hit into a block, stimulating head-on collision. 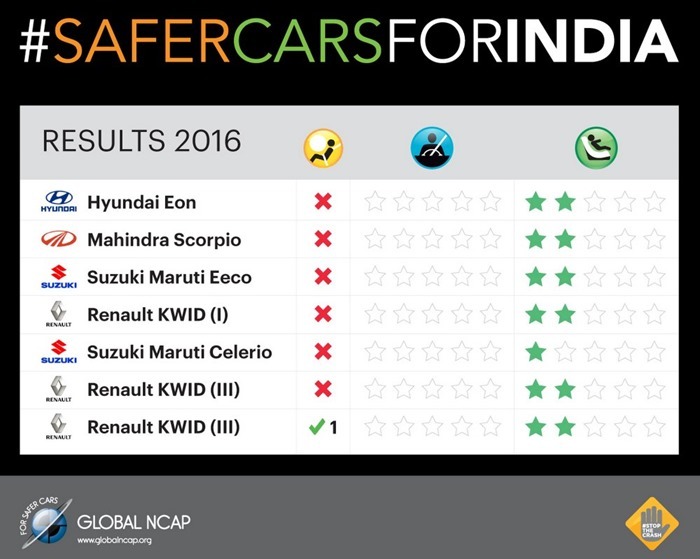 Interestingly, only Toyota Etios and Volkswagen Polo received 4-star rating. Meanwhile, auto-industry in general has refused to accept the authenticity of these car crash test results; and accused Global NCAP of scare mongering. They said that all cars made inside India adhere to strict safety standards, as mandated by Indian Govt. 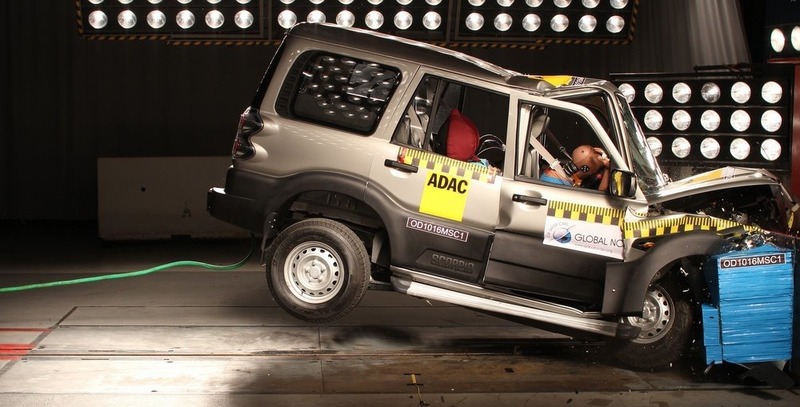 Maruti Suzuki said, “The tests by Global NCAP are conducted at speeds that are higher than those prescribed by the regulatory authorities not only in India but also in Europe and USA. The results of Global NCAP have to be seen in that perspective. Besides the auto-lobby also said that they are working to implement Bharat NCAP Guidelines, which will come into force next year. SIAM has replied that every auto-manufacturer in India adhere to 60 safety and emissions standards, which are at par with international guidelines. After the crash test results came out, Renault has promised to study the test results, and improve its performance. Global NCAP has said that they will again re evaluate their cars. Here are all the results of the car crash tests. Here is our report on Global NCAP’s 2015 car crash test results. "Celerio, Eon, Kwid, Scorpio, Eeco Badly Fail NCAP Crash Tests; Auto Industry Accuse Them of Scaremongering", 5 out of 5 based on 1 ratings.